I’ve been home from the hospital since Tuesday afternoon, and have made a few observations about post-sleeve life that I thought were worth sharing. These might be especially helpful if you or someone you know is thinking about bariatric surgery. Liquid Lortab tastes truly awful. It is weird having to inject myself with Lovenox (a blood thinner prescribed to prevent development of blood clots post-surgery). I’ve never had to inject myself with anything before so this is odd to me. That being said, the bruises I’ve developed as a result look wicked. My husband told me the next time we go out in public he wants a shirt that says “I didn’t touch her” because the bruises look like I’ve been beaten. My sleeve does not like cold liquids. At all. I hope this changes the longer I am out from surgery because I love iced tea! My belly currently has a Frankenbelly kind of look to it due to the swelling and incisions. I am hopeful this will go away over the next couple of weeks. Walking to move gas around never felt so good. My intestines have finally caught up with the rest of my GI tract and are producing a mighty wind on the regular. This is a good thing. Chicken broth never tasted so good until now. I felt like a rockstar pulling out the pain pump catheter that was left in me. This also reaffirmed that I made the correct career choice back in the day (I am a HS Biology teacher, not a doctor like I wanted to be as an undergrad). As a contrast, having a JP drain pulled out of your abdomen will make you wish for death and you will be sad when it does not come. I nearly passed out when the nurse pulled it out of me. It felt like my insides were being pulled outside. That was the only time during my nearly 48 hours in hospital that I cried. Using an interval timer to ensure I get in enough fluids each day has been truly helpful. I’m currently aiming for 1 ounce every 10 minutes to try and get at least 64 ounces daily. I am working on getting in more than that if possible. So far, it’s working. A full liquid diet is really not too terrible. At least now I can have soup! Besides, the thought of eating anything solid is repulsive and makes me a bit nauseous. Solids will come in time–about 2 and a half weeks from now. An abdominal binder has been a godsend. It keeps everything from jiggling too much, and reduces the pain slightly. Getting ready to go home. This abdominal binder has been a godsend! Empire waists are also awesome! Empire waist dresses are the bomb right now. I can’t really wear anything with a waist since some of my incisions are right near my waistline. I don’t want to irritate them so anything sans waistline is a good thing. 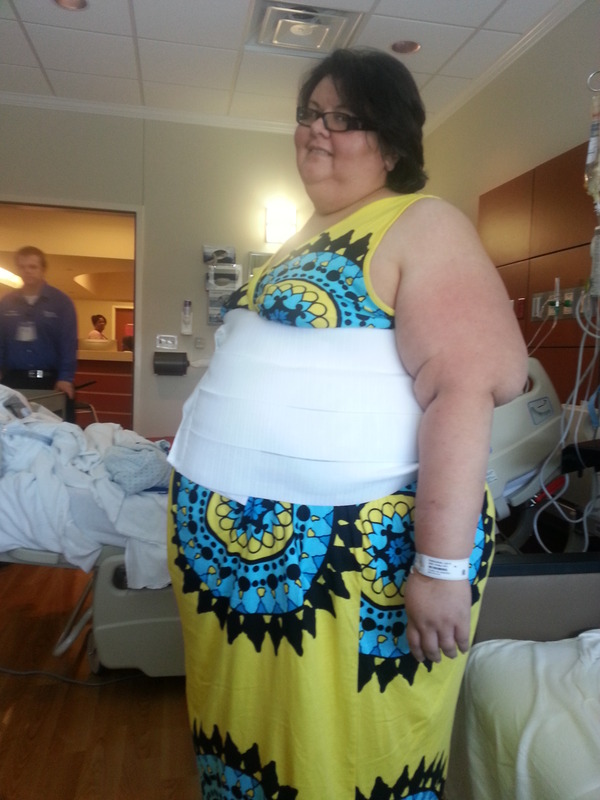 I’m glad I bought a few dresses before surgery! I am grateful that I chose the doctor I did to do my surgery. Dr. Nicholson was fantastic on surgery day! He was pleased that I’d lost as much weight as I had and that I began my pre-op diet a week earlier than he asked me to. He is a wonderful doctor and I highly recommend him. Every day has been easier than the day before. Yes, there is still pain and I know it will be like this for a while but things really are getting easier by the day. This entry was posted in post-op, the sleeve, vsg, weight loss surgery and tagged medications after VSG, post-op life, sleeve gastrectomy, the body is a funny thing, VSG, vsg realness, WLS. Bookmark the permalink.